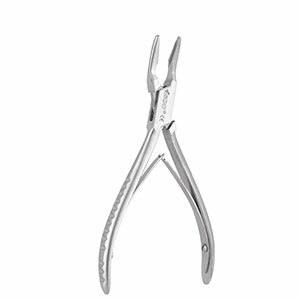 Blumenthal Rongeur is a double spring, plier instrument used in a variety of procedures to trim and remove bone. While large amounts of bone can be removed with rongeurs, pieces should be removed in small bites. Blumenthal rongeurs are available with three different angle tips, which allows them to be both side and end cutting and therefore useful in difficult to reach areas. They are often used in dental procedures to remove inter-radicular bone.